TERRACE MATES™ offers an innovative solution to your search for shade and dining space on narrow balconies and terraces. 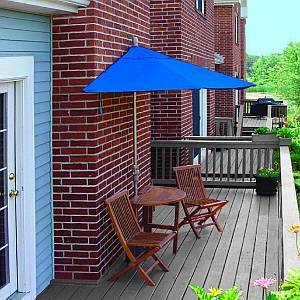 At last, condominium, townhouse, and apartment dwellers can effortlessly transform cramped and long ignored patio, deck, or veranda areas into a welcoming and vibrant addition to home and lifestyle. 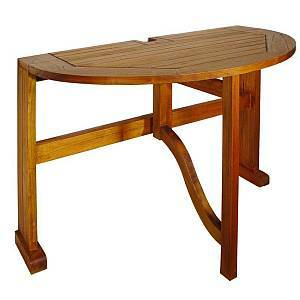 TERRACE MATES tables come in your choice of 3 different hardwood styles: Caleo, Villa, and Bistro. 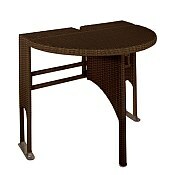 New additions to the Terrace Mate collection are the resin wicker tables and stackable chairs. 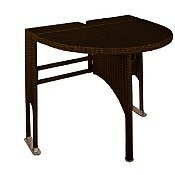 The Wicker tables come in 2 different sizes and you can choose from 2 different colors. 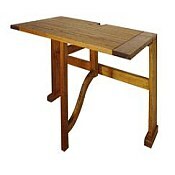 All tables are specially designed to stand, without attachment, in front of a wall, fence, window, or sliding glass door. 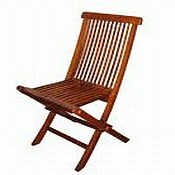 The Folding Chairs (sold in pairs only) come in 2 styles: the side chair and the arm chair. 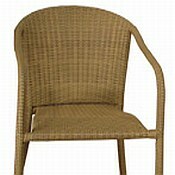 The Stackable resin wicker arm chairs have also been added to compliment your wicker tables if you so choose. TERRACE MATES™ outdoor tables and chairs conveniently create a delightful outdoor area for dining, relaxing, or enjoying the view. When not in use, the table and chairs can be folded neatly along the wall and out of the way to conserve space. TERRACE MATES™ versatile and portable designs are essential for any outdoor event where unused space can be converted into useful sitting and dining areas. It is ideal for sidewalk Café's where restaurateurs can create or expand their outdoor seating capacity. 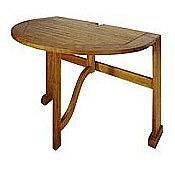 TERRACE MATES™ tables and chairs are made of strong, durable hardwood that can withstand the elements year after year. 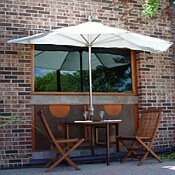 TERRACE MATES™ furniture is a perfect match for the Off-the-Wall, the Half Umbrella. 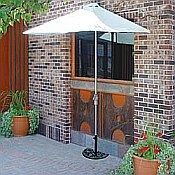 This unique umbrella provides the right amount of shade for your terrace, patio, balcony, or other outdoor living area so that you can safely enjoy the fresh air on even the sunniest of days. 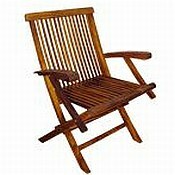 Please click below on the item in which you are interested for details and pricing.